“AAA’s tests reveal that there is no benefit to using premium gasoline in a vehicle that requires regular fuel,” said Megan McKernan, manager of the Automobile Club of Southern California’s Automotive Research Center. “Premium gasoline is specifically formulated to be compatible with specific types of engine designs and most vehicles cannot take advantage of the higher octane rating. “Using premium fuel in a vehicle designed for regular is like throwing dollars out the window while you are driving,” she added. To calculate the total annual cost of using premium gasoline when not required by the vehicle manufacturer, AAA conducted a comprehensive analysis that included a U.S. consumer survey, Federal Highway Administration data, per-gallon costs of premium gasoline and regular gasoline and the average number of fill-ups annually. All testing was conducted at the Automotive Club of Southern California’s Automotive Research Center in Los Angeles, California, using an industry-standard chassis dynamometer, emissions test equipment and Environmental Protection Agency driving cycles. All gasoline used for testing was EPA Tier III certification fuel with 10 percent ethanol content in both regular and premium grades. Certified test fuel was used to remove variability in fuel quality and additives. 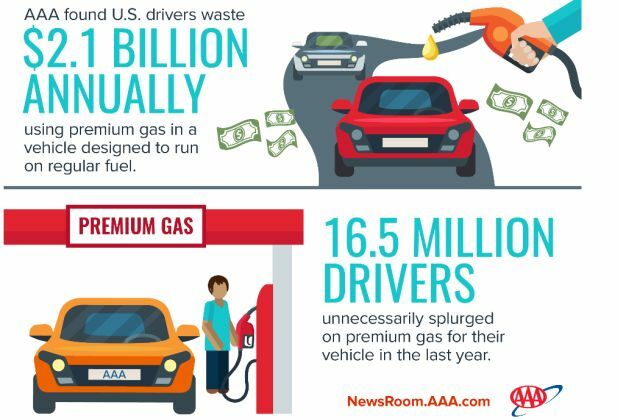 For this study, AAA did not evaluate the effects of using regular fuel in an engine that requires premium gasoline.